As Lost Canadian advocate Don Chapman announced that his group expects to take the Canadian government to court over ongoing discrimination, a wave of approval went through the room of Chinese-Canadian war veterans. 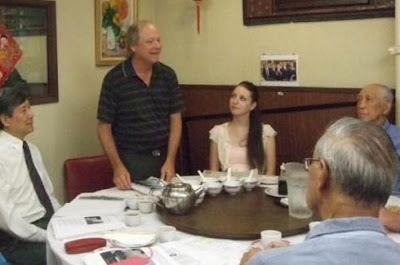 Chapman looked out at the group of Chinese-Canadian war veterans of Pacific Unit 280 and members of Chinese Canadian Military Museum Society assembled at Foo's Ho Ho Restaurant. "We're 100 per cent behind you on this, Don," Alfred Woo, a member of the Chinese Canadian Military Museum Society, said. "You people were the only ones who supported the Lost Canadians as a group early on -- I thank you so much for that," Chapman answered. Lost Canadians are a group of Canadian citizens stripped of their citizenship by the 1947 Canadian Citizenship Act and subsequent amendments to the law. Addressing the cases of famous Lost Canadians, such as Jackie Scott, who was the child of a war bride, and World War II veteran Guy Valliere, Chapman spoke about the sexist and racist policies that have led to legitimate Canadians being denied citizenship. The Chinese-Canadian war veterans, some of them wearing their medals, nodded as they listened. Themselves denied the right to vote in Canada until 1947 -- two years after serving the country during the war -- many older Chinese-Canadians understood what it was like to be denied equal rights. Gim Wong, an 88-year-old former air force member and war veteran, stood up to share his story of how he was turned down from signing up for the army based on his race. A talented air gunner, he wasn't allowed to vote at the time that he signed up for the army in 1943, and fought with the government on citizenship issues such as immigration and the Chinese head tax throughout his life. The group discussed posthumous citizenship for Chinese-Canadians who fought in the war and died during combat. "These people fought for Canada and paid the ultimate price," Chapman said. "They are Canadians of the highest order." Although an amendment to the 1947 Citizenship Act granted citizenship to the majority of Lost Canadians in 2009, Chapman said the legislation created a new class of stateless individuals and continues to leave out five per cent of Lost Canadians who were born prior to 1947. He said that he would continue to pressure the government until all legitimate Lost Canaidans are granted citizenship. Read more about the Lost Canadians in other Vancouver Observer stories.